A trip into the heartland — and the past — with the indefatigable ’80s pop star. Wisconsin Dells doesn’t have close to 30,000 people in the entire town, which is situated in the south-central part of the state, about a two-hour drive west of Milwaukee. As Wisconsin’s tourism hub, its population swells in the summer months depending on the weather — an area dense with woodlands, lakes, water parks, and wax museums, Wisconsin Dells is a relatively cheap place to take the kids on vacation, though omnipresent storm clouds chased away visitors in early June like a great white shark stalking a beach community. Still, all but 100 or so tickets were sold for the night’s Huey Lewis and the News concert several hours before showtime. Towns like this are Huey’s bread and butter these days. Many of those ticket buyers were coming to hear the songs from Sports played from front to back. While Sports isn’t usually mentioned among the most popular musical blockbusters of the ’80s, it belongs in that company. Of the album’s nine tracks, five charted in the Top 20: “I Want a New Drug,” “The Heart of Rock & Roll,” “Heart and Soul,” “If This Is It,” and “Walking on a Thin Line.” (One of those songs might be playing on the “cool FM” oldies radio station in your town at this very second.) Sports was one of only five no. 1 albums during all of 1984, the fewest number in history. The others were Michael Jackson’s Thriller, the Footloose soundtrack, Prince’s Purple Rain, and Bruce Springsteen’s Born in the U.S.A. Huey Lewis held the summit for only one week, but Sports sold 6 million records in ’84 alone (on the way to topping 10 million), good for second on the year-end sales list behind Thriller. Bon Jovi was also opening for .38 Special when Slippery When Wet went to no. 1. In the realm of ’80s rock bands, .38 Special is always the bridesmaid, never the bride. Lewis does not sound bitter when he says this. He’s a little older than you remember — the lines on his forehead are deeper, his voice more sandpapery, and he untucks his almond brown button-up shirt to hide his 62-year-old paunch. (He also apparently keeps his collection of Skittles-colored, proto-Arsenio suit jackets in mothballs. They are nowhere in sight in his dressing room.) But for the most part, in appearance and demeanor, Lewis is unchanged from the handsome, confidently smirking cool-dad figure on the cover of Sports. For much of his life, Lewis has been cursed with a face that looks eternally 41, but he’s now reached the point where this is a good thing. In person, he’s friendly, though not particularly gregarious — he prefers not to do interviews on show days, which is difficult because nearly every day is a show day. After tonight’s concert, the band will shower, the crew will load out, and Lewis’s 25-person caravan (which he refers to as his “small business”) will hop back on their buses and drive 403 miles to Anderson, Indiana, for tomorrow night’s gig at a horse track and casino. In the next seven days, Lewis will play five shows in places like Paducah, Kentucky, and Quapaw, Oklahoma, along with bigger cities like Dallas and Cincinnati. Even with the gaudy 1980s sales statistics, Huey Lewis and the News has the work ethic of a 2010s indie band. As Doc Brown explains in Back to the Future, not long after Marty McFly skateboards to school on the back of a Jeep while Lewis’s “The Power of Love” blares on the soundtrack, there’s no discernible difference between experiencing the present, past, or future when you’re moving freely in the space-time continuum. No matter where (or when) you go, the trip appears to be instantaneous. Talking with Huey Lewis replicates this sensation, and it also doesn’t. I can measure the passage of time by my emotional state; I’m not nearly as ecstatic about meeting Huey Lewis at age 35 as I would’ve been at age 8. But for Lewis, who consciously or not makes his living by constructing a public version of himself that hasn’t existed since the original Knight Rider was canceled, the present might as well be interchangeable with the past and future. It’s all one big jumble that somehow makes sense, like songs from different albums recontextualized into a concert set list. Perhaps that’s why when I ask Lewis about Sports — the album he’s ostensibly promoting by talking to me, even if, like most of his fans, I’ve already owned it for 30 years — he’d rather go back to the future. Lewis tells me about the one song the band’s playing tonight that doesn’t originate from the 20th century — a pleasantly poppy love song called “While We’re Young.” He’s excited about the track, though he’s not sure if it will end up on a record. Here’s one thing the record business is definitely no longer good at: selling rock albums made by thirtysomething white men who are into sax solos and doo-wop. MJ, Prince, Springsteen — you can point to contemporary artists attempting to follow their commercial examples. 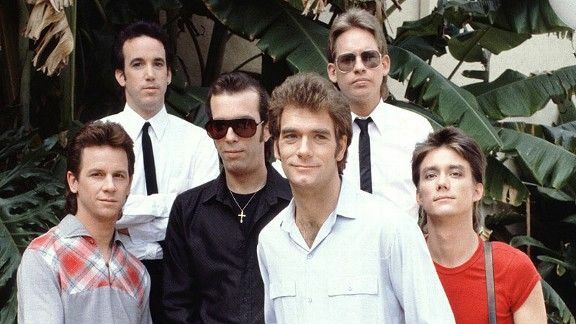 But Huey Lewis represents an archetype that is not only absent from the pop charts, it’s one that is nearly impossible for a young person to imagine ever being popular. Sports is the epitome of old-world musical broadness — it touches on new wave, ’60s soul, beer-commercial blues, and classic honky-tonk. One of the album’s most recognizable tracks, “I Want a New Drug,” topped the dance charts. That’s right — the clubs of ’84 banged to Huey Lewis and the News. It’s inconceivable that any album today could (or would even attempt to) cover so many bases in such a deliberate “one size fits all” manner. Again, I want to emphasize that Lewis doesn’t say any of this with anger or resentment. Later, he’ll jokingly (I think) ask that I tone down his mildly critical (and sensible) comments about the record industry lest he offend someone powerful. Lewis hasn’t been a fixture on pop radio for nearly 25 years, but he remains a reflexively mainstream artist. It’s not in his nature to upset the applecart, or to appear desirous of approaching applecart-upsetting status. He’s still wired to give the public what it wants, however the public wants it, many years after the public has moved on. Besides, Lewis knows his career was altered by larger cultural forces no record label could possibly control. I‘d like to dispute the assertion that Huey Lewis doesn’t have an audience. In fact, Huey Lewis’s audience is coming at me like a battalion of doughy zombies. Lewis and I are attempting to traverse the short 100-foot jog from the theater’s back door to Lewis’s tour bus, but his fans are on us as soon as we step outside. One after another they walk up to ask for a photo. Lewis is patient and accommodating, though he also seems vaguely annoyed — he’s generously agreed to extend our interview after the sound check, even though showtime is less than 45 minutes away, and this is prolonging the inconvenience. A middle-aged woman sweetly asks for a photo after telling Lewis that she’s following the tour to Cincinnati next week. A burly guy suggests that Lewis sign the Blues Brothers T-shirt he’s wearing, but a Sharpie is nowhere to be found. By the time we get inside the bus, a walk that should’ve taken a few seconds has eaten up several minutes. “Let’s face it, anybody who does what I do has got to like the attention a little bit or else he wouldn’t have done it in the first place,” Lewis says after grabbing a seat on the bus. Based on my limited experience hanging out on tour buses, this one seems nice enough. There’s a PGA tournament playing on the flat-screen television, and a tray of tasty chocolate chip cookies sits to the left of our table. (Lewis offers me one at the end of the interview.) Year in and year out, during good times and less good times, this is Lewis’s home away from home. In 2013, Huey Lewis and the News will perform about 80 concerts, a typical annual workload even as Lewis approaches his retirement years. 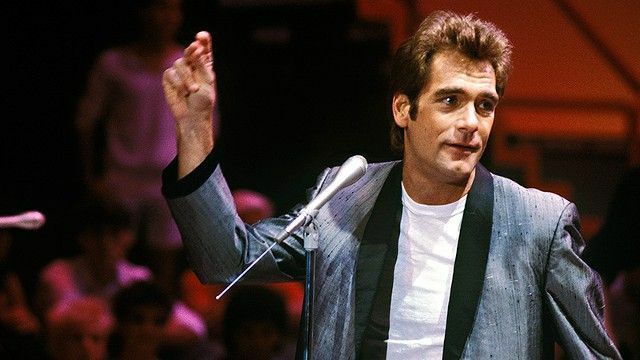 How big was Huey Lewis in the ’80s? Album sales don’t tell the whole story; in this day and age, they barely seem meaningful. It might be helpful to illustrate Lewis’s hugeness via his proximity to other institutions whose hugeness is beyond reproach. For instance, in the iconic (and retrospectively hilarious) video for the 1985 anti-hunger benefit track “We Are the World,” you can see Lewis (outfitted with the requisite headphones and soulfully “serious” facial expression) belting out the song’s bridge with none other than Michael Jackson. 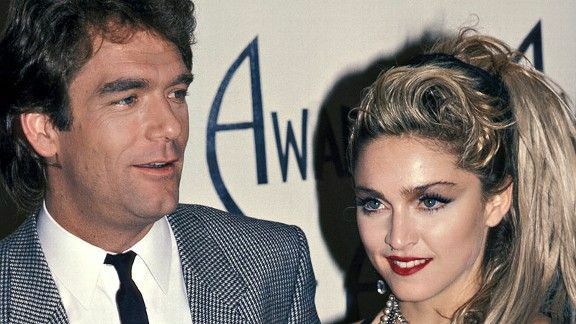 Or in this clip from the 1986 American Music Awards, there’s a tuxedoed and mysteriously amused-looking Prince presenting Huey Lewis and the News with the award for favorite pop/rock single for “The Power of Love.” I’d be derelict in my duty as a chronicler of Huey Lewis’s legacy if I didn’t mention the book and film versions of American Psycho — parodied earlier this year by both Lewis and Kanye West — which either elevated Sports and its nearly-as-successful sequel, 1986’s Fore!, into emblems of their era (as Lewis himself has suggested)2 or reduced Lewis’s music to a caricature of plastic inanity that only a sociopath could love. Either way, Huey Lewis, for a few years anyway, had as much stature in pop music as anybody in his time. Lol Halsey has been Lewis’s tour manager for 31 years, and the band’s manager for a year and a half. Before Lewis, Halsey worked for the Doobie Brothers. When I spoke to him, there was a framed poster of the Doobie Brothers behind him. I assume this is always hanging backstage at the Crystal Grand Music Theatre, not, like, part of the band’s rider or something. Because of the all-consuming nature of pop celebrity in the ’80s, when monolithic corporate media reiterated the same set of artists over and over again on multiple platforms in pursuit of maximum market penetration, Lewis is arguably still more famous today than all but a small handful of contemporary music stars. He remains part of a select fraternity of musicians who can draw a couple thousand people in dozens (if not hundreds) of middle-American towns like Wisconsin Dells scattered throughout the country. He can’t play the sorts of rooms that Springsteen or Prince play, but those guys don’t rely any less on what they accomplished in 1984 for their livelihoods than Lewis does. The difference is that Springsteen and Prince transcended their eras and became universal touchstones; Lewis will probably always be associated with Marty McFly and Patrick Bateman. This has made moving on creatively a seemingly insurmountable challenge. “When you’ve written a bunch of songs, it’s hard. I mean, we wrote ‘The Heart of Rock & Roll.’ Now can I write ‘The Soul of Rock & Roll’? No. Or ‘The Brains of Rock & Roll’? I mean, we really almost can’t write a song with rock and roll in the title,” he says resignedly. It’s an odd though not irrelevant point — “The Brains of Rock & Roll” truly is a terrible concept for a song. But Huey Lewis has lived a pretty amazing life. While making the Sports promotional rounds — the album was rereleased in May with a bonus disc of live versions of each track — Lewis has regaled journalists and podcasters with his greatest exploits. Some are more well-worn anecdotes. As a kid growing up in the Bay Area, Lewis was primed for a career in music by a physician father who moonlighted as a jazz drummer and an artist mother who started out as a ’50s beatnik and evolved into a ’60s hippie. Through his mother, young Huey (then known as Hugh Anthony Cregg III) encountered Allen Ginsberg and Charles Mingus. His mother took in Billy Roberts, the guy who wrote “Hey Joe,” as a boarder. After graduating high school a year early — he was a math whiz who scored a perfect 800 on the SAT — Lewis hitchhiked across America, sneaked onto a transatlantic flight without paying, and played harp in pickup bands while exploring Europe. He saw early gigs by the Grateful Dead at the Fillmore, and — a decade later, when his band Clover was encamped in London under the tutelage of Elvis Costello cohort Jake Riviera — the Clash at the Round House. He was best pals with Phil Lynott and played harmonica on Thin Lizzy’s Live and Dangerous. And this is just stuff that happened to Lewis before he was famous. Surely he’s accrued enough interesting experiences to have something new to say about his life now? “The story of a 62-year-old — nobody wants to hear that,” Lewis says dismissively. “That’s not going to relate. That’s not timeless. That’s why people write love songs. What’s her name — Taylor Swift said all of her songs are love songs because that’s what people want. That’s what young girls think about 24/7. That’s what young guys think about — the gal, the guy.” Lewis’s pop instincts remain perceptive, even as they’re telling him that he’s finished as a pop artist. With this freedom, Huey Lewis created an album that would’ve exceeded any early-’80s record executive’s wildest commercial expectations. Sports was the product of a new technological age in pop music — the competition to create the most pristine-sounding and perfectly sculpted earworms was as fierce as it’s ever been. Survival for an anachronistic pop-rock band like Huey Lewis and the News required submission to the machine (as well as the machines). The primary songwriters on Sports were Lewis, guitarist Chris Hayes (who departed the News in 2000), and guitarist/saxophonist Johnny Colla, who remains Lewis’s musical copilot. A laid-back, unassuming type, Colla wanders up to me in the hospitality room a half-hour before showtime. While snacking on a plate of watery broccoli and cauliflower, he explains how he finished off “The Power of Love,” the group’s first no. 1 single and another high point between the peaks of Sports and Fore!, after it was mostly written by Lewis and Hayes. “I demoed the tune for Chris and I came up with [imitates the synth-based hook of “The Power of Love”] duh duh, duh duh. And what do you know? It became the intro, the chorus, and the outro,” he says. “Chris had written it as lots of moving notes, and I thought it’s gotta be a bit more pop. Something’s gotta make it snap. That was my contribution. I thought it was worth a couple bucks, a couple points.” While Colla is telling this story, I’m trying to remember anything about “The Power of Love” that isn’t duh duh, duh duh. It’s really only a small part of the song, and yet it is the song. Colla’s most valuable contribution to Sports was the supremely corny and totally irresistible sock-hop ballad “If This Is It.” The song is indicative of Sports‘s appeal: It immediately conjures nostalgia for a warm, fuzzy, and romantically fabricated past. It sounds simultaneously like the early ’60s and the early ’80s, two pop-music periods that will probably always be reassuring in their resolute squareness. It was Colla’s goal to write a summer song, and that’s what “If This Is It” became in ’84, hitting the radio in July and showing up in the Top 10 not long after. And the song has had legs, even subliminally on people who have never heard of Sports. “I’m in the gym today and this guy knows I’m somebody but he can’t figure it out,” Colla says. “This fella, he’s much younger — I come to find out he’s 35 years old — this black fella, and we start talking. He’s here on a conference, and I finally got around to what I do, and I said, ‘Huey Lewis and the News. You ever heard of us?’ ‘Nah, man. Are you still together?’ And I said, ‘Well, over 30 years.’ ‘Whoa, name a song.’ So I started naming ‘Heart of Rock & Roll,’ ‘Power of Love,’ ‘I Want a New Drug,’ and he goes, ‘Nah, nah, nah.’ I said, ‘If This Is It,’ and he goes, ‘Oh, yeah! Man, that’s the one! '” Colla smiles like the song just reappeared in the Top 10. Lewis’s 2000 duet with Gwyneth Paltrow, “Cruisin,’” from the karaoke movie Duets, topped the adult contemporary chart. Tonight, in Wisconsin Dells, where the Huey Lewis concert is the hottest ticket in town, it seems like a gas. I planned to maintain a safe critical distance from my first Huey Lewis concert in 22 years, but that all disappears like a speeding DeLorean from the Twin Pines Mall parking lot by the time Huey inserts “Wisconsin Dells!” into the roll call of cities in “The Heart of Rock & Roll.” I am powerless against this man’s crowd-pleasing capabilities — Huey Lewis has got me, and he’s hardly broken a sweat yet. I’m suddenly gripped by a ravenous craving for Sports deep cuts. Like the rest of the audience, I find myself mouthing the words to “Bad Is Bad” in spite of not singing along to “Bad Is Bad” in decades. I’m eagerly anticipating hearing “You Crack Me Up” live for the first time, and I don’t even like “You Crack Me Up.” And at the end of every song I cheer along with 2,000 other Huey Lewis fans. The cheering is so loud you can almost imagine it being 30,000.